The Continental Corporation achieved its annual targets in 2014 while also fulfilling several long-term objectives. As a technology leader the company generated sales of €34.5 billion as targeted and achieved an adjusted margin of 11.3 percent. The return on capital employed (ROCE) came to exactly 20 percent in 2014, thus having risen for the fifth year in a row. Net indebtedness decreased further by almost €1.5 billion to approximately €2.8 billion. The gearing ratio at the end of the year was 25.6 percent. For the current fiscal year, Continental aims to achieve a rise in sales of almost 9 percent to around €37.5 billion, which includes a contribution of at least €1.3 billion from the first-time consolidation of the acquired company Veyance Technologies. The way things look now, it appears that positive exchange rate effects could contribute an additional €1 billion to sales. The EBIT margin is expected to exceed 10.5 percent in 2015. Growth impetus is anticipated from Asia again, particularly China, and from North America. For 2015, Continental expects global production of vehicles weighing up to six tons to total approximately 89 million units. “Another noteworthy aspect is the strong free cash flow of more than €2 billion. This enabled us to reduce net indebtedness to its lowest level since 2006. At the same time, we invested more than €4 billion in property, plant and equipment, software, and research and development,” said Degenhart. During the “Continental Webcast: Fiscal Year 2014” – the first fully digital press conference of a DAX30 company’s fiscal results – Degenhart also outlined plans for the development of the company up until 2020: “We are focusing on the increasing need for mobility and growing demand from our industrial customers. The production volume for vehicles weighing up to six tons is expected to rise to between 100 million and 105 million vehicles. Furthermore, installation of electronics and software will continue to grow substantially, driven by growing demands from end-users and increasingly strict legal requirements for safety and energy consumption. It is partly on this basis that we are aiming for profitable sales of over €50 billion in 2020,” explained Degenhart. 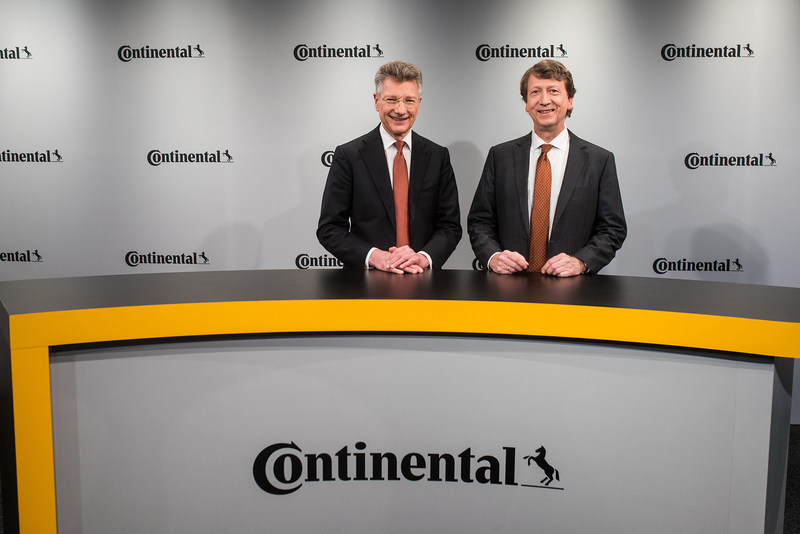 In 2014, the Continental Corporation increased its sales by 3.5 percent to €34.5 billion. Adjusted for negative exchange rate effects of approximately €470 million and changes in the scope of consolidation, the increase comes to 4.2 percent. EBIT grew by 2.5 percent to a good €3.3 billion. The EBIT margin was 9.7 percent after 9.8 percent in fiscal 2013. Adjusted EBIT, adjusted particularly for acquisition-related amortization and special effects, rose by 3.7 percent to almost €3.9 billion, corresponding to 11.3 percent of sales after 11.2 percent in the previous year. As previously announced, the reduced net indebtedness and improved credit and bond conditions had a significant positive impact on the Continental Corporation's net interest expense. “Compared to 2013, our net interest expense improved by more than half a billion euros to minus €265 million,” said Chief Financial Officer Wolfgang Schäfer. “This positive development is attributable in particular to the early redemption of four bonds issued in 2010 and their partial refinancing with considerably lower-interest bonds in 2013. In the current year, we are anticipating net interest expense of around €300 million due to the purchase price payment for Veyance Technologies. Furthermore, we are planning on achieving free cash flow of at least €1.5 billion before acquisitions,” Schäfer explained. Continental invested heavily in research and development again in 2014. This expenditure amounted to more than €2.1 billion, corresponding to 6.2 percent of sales after 5.6 percent in the previous year. In addition, €2.0 billion or 5.9 percent of sales was invested in property, plant and equipment, and software. The capital expenditure ratio is again expected to be around 6 percent in the current fiscal year. The positive business performance is also reflected in the growing number of employees. At the end of 2014, the Continental Corporation had around 190,000 employees, a good 11,000 more than in the previous year. The company's workforce currently totals about 200,000.